Nease High School is the location. Starting at 9:00am the Community Empowerment Series will have their final event with one of the hottest topics that reaches everyone with a keypad or a cell phone. Especially those teenagers that are are heading to prom that evening. Before you snap those picture and post those questionable comments, you will benefit from this event featuring Theresa Payton. She is one of our countries leading cyber safety experts and will be discussing cyber bullying, identity theft, and cell phone safety including sexting. · Sexting: 71% of teen girls and 67% of teen boys have participated in posting/sending sexually suggestive content. Dr. Joseph Joyner is recommending that every teacher, parent and student attends this event and takes advantage of this learning experience. 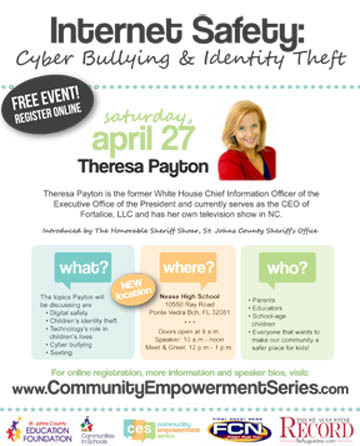 St. Johns County Sheriff Shoar will be introducing Theresa Payton and will have his team available with literature for our community regarding Internet safety and our kids. This is a FREE event and open to the public. It is presented by the St. Johns County Education Foundation and Communities in Schools of St. Johns County and sponsored by The St. Augustine Record, First Coast News and other generous donors. Protecting Your Internet Identity Book is Here! It’s finally here! 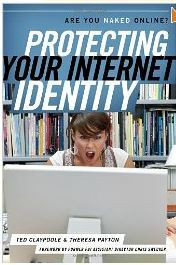 Isn’t it time you protect you and your family’s Internet identity? Who is looking at you online? The government, your neighbors, employers, friends – the short answer is EVERYONE. This book is a handy guide that digs deep past the media headlines to tell you how your data is collected and used. The author’s provide practical tips on how to regain control of your internet persona while also fending off identity thieves and other cybersnoops. And, for those with kids in their lives, Chapter 9 is dedicated to digital natives – the generation born into our digital age that cannot imagine life without instant access to info! Internet image impersonation is easy to do. Anyone can open a free email account with Yahoo!, Hotmail, Google, or any other email provider and use your name. Setting up a social media account on social networking sites such as Facebook or MySpace is equally simple. With a little information about your life, your impersonator could even fool those people closest to you. Unfortunately, it can be very difficult to remove these accounts from the Internet. Most Online companies assume that an account is opened in good faith, and you will probably have to prove the damage was done by an imposter (and prove that the imposter is not simply another person who happens to have the same name), before a site such as Yahoo! or Facebook would consider closing an active account. Do You Have The Facts to Support a U.S. Lawsuit to Protect Your Online Image? Ted and Theresa’s new book, Protecting Your Internet Identity: Are You Naked Online? Follow Theresa Payton on Twitter. I was more than thrilled to meet Anderson Cooper and must say I was humbled by his sincere concern for those that are victimized by others that are being destroyed online by vicious keystrokes. For those that don’t know my story, it starts in 2000 and ended in 2006 with a landmark victory for Internet Defamation and invasion of privacy. My stories were written and published by Health Communications Inc (HCI – home of Chicken Soup for the Soup book series) and over the past decade, my mistakes and my knowledge has helped thousands of people and families to make better decisions for their teens and their virtual lives. Whether you are considering residential therapy or thinking about creating a Facebook page, you will learn from the mistake I made. After spending years in litigation – with two major victories – and almost being silenced to tell my story, I am here to not only share my story, but to be sure what happened to my daughter and myself doesn’t happen to others, but to let you know that what you post online today – can and will haunt you tomorrow! 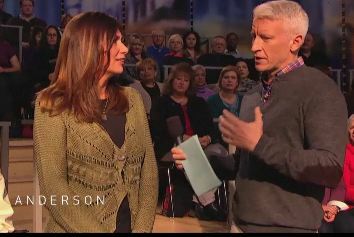 Check out part of my segment on Anderson Cooper – click here. My books: Wit’s End and Google Bomb are both available on Amazon! Do you believe your online image, reputation and character are protected? Firewalls broken – hackers hacking – and you are now virtually invaded! Learn from Sue Scheff’s $11M defamation verdict that changed Internet Culture. Sue Scheff was a regular person who found out in the most evil way what slander awaited her in cyberspace. Scheff’s business, reputation, and identity were stolen, livelihood ruined, her mental health threatened after viral defamatory statements emerged. Scheff was hit with a Google bomb. Like an epidemic, Google bombs are the latest lethal legal weapon to destroy character and reputations. Our First Lady was hit. No one is immune. We must be proactive in maintaining our virtual profile. Still standing and thriving after all she endured both personally and professionally, Scheff now helps others understand the depths of the Internet and what happens when revenge turns to e-venge. Google is the world’s top search engine used by millions each day. Anyone can be defamed easily, all searchable through Google. 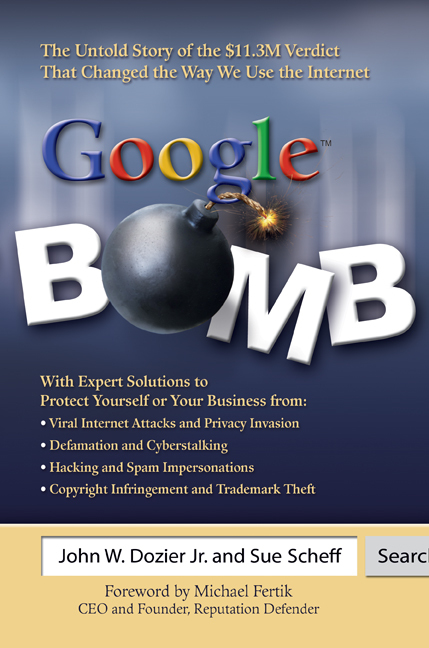 Author Sue Scheff talks about the Google Bomb and its impact on our life. The Internet as a technology for information and quick, inexpensive communication may be fascinating for millions around the globe, but if put to malicious use against someone, it can be a paralyzing weapon. That is what happened in the case of Sue Scheff, author of Google Bomb (HCI Books, 2009). In her book, co-authored with lawyer John W. Dozier, Sue tells the story of her victimization through serial defamatory attacks on the web that destroyed her professional career and trampled her personal reputation as well as her social life. Just by Googling her name, or that of her organization, countless people could mark her and her organization as evil entities, all because of false, malicious, and unchecked accusations (and even effusive abuse) made against her by someone who failed to use her for her own vested interests. In today’s world, Google has become the measure of one’s reputation – hence the term “Google Bomb”. Standing up against the coercion, however, Sue finally won the historical $11.3 million defamation suit against the culprit responsible for her loss. It was very informative talking to Sue for an interview to run in the journal Recovering the Self (Vol. 3, No 1). Following is a slightly abridged version of Sue’s interview. With the recent headlines about Katherine Evans and her victory in Broward County, Florida regarding a judge’s ruling, stated that she is allowed to sue her former principal. Free speech does not condone defamation, however is what Katherine Evans wrote defamatory? That doesn’t seem to be the case, the story is about the punishment that Evans received following posting ugly comments about one of her teachers. Katherine Evans started the “Ms. Sarah Phelps is the worst teacher I’ve ever met!” group on Facebook back in 2007 and featured a photograph of the teacher and an invitation for other students to “express your feelings of hatred,” prompting a three-day suspension from school principal Peter Bayer. The suspension came two months after the page was taken down. Evans was also removed from Advanced Placement classes. Evans wants to have the suspension removed from her disciplinary record and receive a nominal fee for the violation of her First Amendment rights. Remember, what goes online, stays online. What you post today can come back to haunt you later. If you are angry with someone, dislike your boss or teacher – think twice before you post about it. Today once you put it out there, it virtually impossible to take it back, and most people don’t want to end up in a courtroom – no matter what side you are on. There are never any winners. Except the lawyers, in my opinion. Although Katherine Evans has been given the green light to file her case, free speech lives on, however when will people start realizing enough is enough with some forms of Internet abuse? Cyberbullying, Internet predators, and sexting are just the start of the ugliness that lurks online. Eventually the laws need to catch up with the free for all cyberspace. Sue Scheff: One Click Away from…. Have you thought about how dangerous a “click of a mouse” is? Dangerous? As you start a new year, take the time to educate yourself on Internet safety. Learn how you can become proactive in your kids lives both online and off. Learn how that one click can either open doors that you can benefit from, or enter hallways are dark and dangerous. You can put as many parent safety controls on your computer system. You can employ technical gadgets galore, but until you educate yourself and your kids about the dangers that can lurk online, you and your family are not 100% protected. Yes, you can be just one click away: Be sure it is a click into safety not danger. Chat room Safety Tips – Know who your kids are mingling with online. Be an educated parent, you will have safer kids!